The drug gentamicin is used as a treatment for some serious bacterial infection. However, the use of this medication can be toxic to individuals especially if it is not used according to the physician’s prescription [1, 2]. This medication is an example of a broad-spectrum aminoglycoside. Drugs under this category function by binding to the ribosomal subunit of the bacteria. This causes a disruption in the RNA synthesis and leaves the bacteria unable to produce any protein that is vital to its survival . 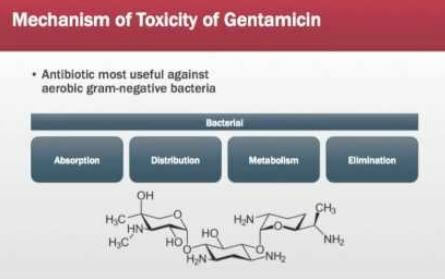 Gentamicin is primarily prescribed for infections caused by Gram-negative bacteria such as Enterobacter, Pseudomonas, and Acinetobacter [1, 2, 3]. It may be prescribed for Gram-positive bacteria but there are more potent agents against these pathogens which are less toxic to the host. These drugs are also ineffective against anaerobic bacteria, viruses, and fungi . The use of gentamicin is known to be as one of the primary causes of bilateral vestibulopathy. Although its exact mechanism is not understood, one of the prevailing views about this matter is that exposure to gentamicin causes the death of inner ear hair cells within the first 2 days of exposure. The death of spiral ganglion cell will occur within 3-15 days after being exposed to gentamicin . There are certain risk factors which may increase the chance of an individual in developing symptoms of toxicity . The total amount of gentamicin given to patients is related to the possibility of developing gentamicin toxicity symptoms. Those who are given a small dose of gentamicin over a longer period of time compared to those who are given a higher dose over a few days of treatment . Some medications such as vancomycin and cisplatin may have a potentiating effect on gentamicin. Furosemide may cause a more rapid entry of gentamicin into the ear and increase the chance of ototoxicity . A mutation of the mitochondria may cause an unusual susceptibility for gentamicin ototoxicity. This is passed from the mother to their infants. About 17% of those who have aminoglycoside toxicity have this condition . Symptoms of vestibular toxicity usually present with imbalance and visual symptoms. The imbalance is worse in the dark where the footing of the patient is more uncertain. Vertigo may also be unusual in these patients. Visual blurring is associated with quick movements of the head which can make it difficult to see road signs while driving or recognize faces while walking [4, 5]. Once the patient presents with symptoms of gentamicin toxicity, the anti-bacterial will be discontinued and they will be given a medication that is appropriate for their condition. A hearing evaluation will be conducted to assess the degree of the damage to the patient. Supportive measures will be provided to address the symptoms that have developed [4, 5]. In order to prevent the occurrence of gentamicin toxicity, the patient must be monitored while the patient is taking the medication. The serum drug level and the renal function of the patient must be checked regularly to ensure that the medication is within the safe level. A hearing evaluation can be conducted before, during, and after the therapy will help in identifying the symptoms of the toxicity. The patient should notify the physician immediately once any changes in their hearing occurs in order to address the problem immediately [4, 5]. Taking gentamicin has its risk and those who take this drug should know what to watch out for to avoid developing gentamicin toxicity. You can join in the discussion by posting your thoughts in the comment section.